"Mad isn’t the word” was Spencer Slaughter’s take on a crazy afternoon of football at the Beacon as Hassocks hosted lowly Loxwood. The Robins knew they would be facing a very different test to when they went to Plaistow Road in September and picked up a 4-0 victory, their first ever win in senior football against the Magpies. Loxwood looked deep in relegation trouble that day, but the appointment of former Haywards Heath Town assistant manager Alex Walsh has led to a marked improvement in results, giving the Magpies hope that they can avoid the drop into Division One. Those hopes were certainly looking up at half time here after 45 minutes of scintillating football from the visitors. By that point, they’d sauntered into a 3-0 lead through goals from Mark Goldson, Sam Karl and former Hassocks favourite Eddie French. The Robins looked dead and buried until Mark Dalgleish breathed new life into his side with a bold treble substitution at the break. 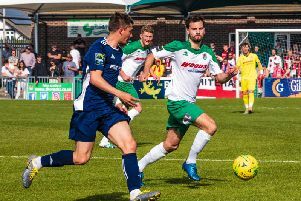 The changes had astonishing results, Hassocks scoring three times in the first 12 minutes of the second half to completely flip the game on its head. They probably should have gone onto win it as well, squandering a couple of opportunities late on to pick up what would have been three very welcome points. Dalgleish’s starting line up showed three changes from the side that had lost 4-1 at Saltdean United a week previously. Badger, Lindsey taking up a position on the flank with Harvey Blake dropping to left back. “We couldn’t defend for toffee in the first half,” said player-coach Slaughter afterwards, but he could quite easily had added that the midfield was all over the place and the front two ineffective as part of the inquest into what went wrong in that opening 45 minutes. Only two players in red emerged with any credit. Liam Benson, who recently became the 50th player to play a century of games for Hassocks in senior football, was fairly strong up front and did a few good things on the rare occasions he saw the ball. Enticknap meanwhile was busy having one of his best games of the season against his former club as those around him faltered, doing his best to break up play and get the Robins on the front foot. The Loxwood goals came at regular intervals, Goldson getting the party started with 10 minutes on the clock, Karl doubling the lead on 24 and then French making it three eight minutes before the break against the club he made his name at as Sussex Under 18s captain nearly two decades ago. Hassocks came off at half time shell shocked. Dalgleish’s answer was to stick everything he had on red and gamble on using all of his subs in one hit. Off came Dan Jacques, Bradley Tighe and Lindsey and on came Slaughter, Dan Stokes and George Brown for his first appearance since returning to Hassocks from Haywards Heath. The three new faces were electric from the first whistle, while Dalgleish’s decision to switch from 4-4-2 to 4-3-3 caught Loxwood by surprise as they were completely overwhelmed. Just four minutes of the second half had elapsed when Slaughter,Brown and Phil Johnson linked up to fashion a chance for Enticknap who made no mistake, smashing the ball past Liam Matthews and into the top corner for a deserved first senior goal for the Robins. Three minutes later and Slaughter started a break down the right that was finished off by Brown, netting just seven minutes into his latest debut to highlight just what a massive addition the midfielder can be in his third spell with the club. It was a brilliant passing move that gave Hassocks their equaliser four minutes after Brown’s strike. This time the Robins broke down the left; Slaughter sweeping the ball to Joe Bull, Bull moving it onto Brown, Brown releasing Johnson and Johnson crossing to Slaughter who had continued his run to slide in on the stretch at the far post. Loxwood pulled themselves together after that and did well to weather the rest of the Hassocks storm, taking the sting out of the game. Not that the three-goals-in-12-minutes blitz was the end of the action. With Stokes controlling the tempo with a textbook midfield display, Hassocks came close to snatching a winner on three occasions. The normally reliable Johnson kicked his standing leg rather than the ball when just six yards out from Matthews’ goal, Benson had a strong penalty appeal turned down when referee Connall Bartlett missed what appeared to be a blatant push in the box and again Johnson was wasteful when played in by Slaughter right at the death. Hassocks: Green; Tighe, Broomfield, Jacques, Blake; Bull, Enticknap, Mills, Lindsey; Johnson, Benson. Subs: Slaughter (Jacques 45), Brown (Tighe 45), Stokes (Lindsey 45).